Scene from the 200th episode of SpongeBob SquarePants, "Goodbye, Krabby Patty?". Di Più Nickelodeon: Nickelodeon Italy To Premiere "ToonMarty" On Friday 9th June 2017! 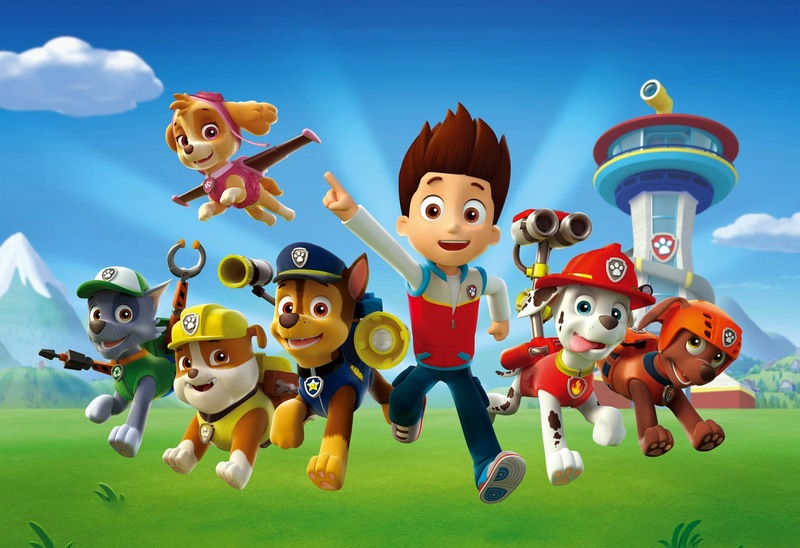 #ReadAlong PAW Patrol Song | 'Gimme an Alpha-Beat!' (w/ Lyrics) | Nick Jr.
K is for kittens. What will they do? R is a ‘ruff ruff’ rescue — yay, woo-hoo! Z is for zipline — gonna save the day! More Nick: Nickelodeon USA To Premiere "Sunny Day" On Monday 21st August 2017! 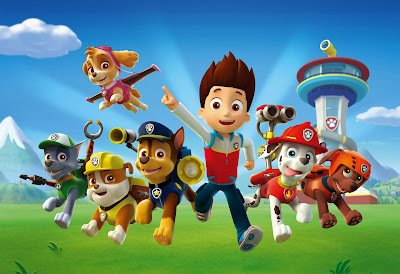 Preschoolers can watch PAW Patrol full episodes, play games, and more in the free Nick Jr. App and at NickJr.com: iTunes | Google Play | Amazon. 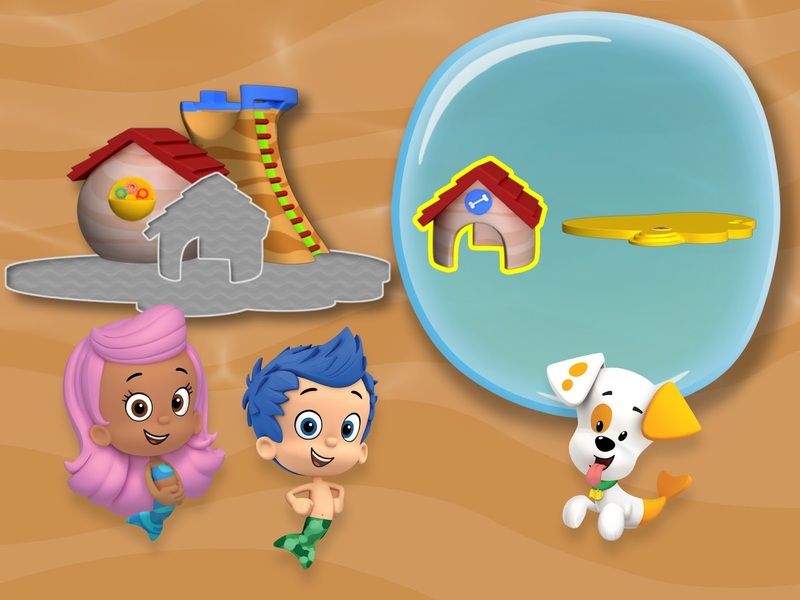 More Nick: Nickelodeon Introduces Interactive, Play-Along Preschool Videos In NOGGIN App, June 1 On iOS! All your fave Nick stars are heading to Camp Nickelodeon this summer! Catch them in Nickelodeon's Sizzling Summer Camp Special, premiering Sunday June 4th at 7:00pm ET/PT, only on Nick USA! More Nick: Nickelodeon's The Thundermans Set To Reach Landmark 100th Episode; Nick Orders New Comedy Series "Knight Squad"! Di Più Nickelodeon: Nick Jr. Italy To Premiere "Nella the Princess Knight" On Monday 19th June 2017! Follow NickALive! on Twitter, Tumblr, Google+, via RSS, on Instagram, and/or Facebook for the latest Nickelodeon Italy and ToonMarty News and Highlights! More Nick: Are You A SpongeMaster? Download The App And Play All This May Half Term With Nicktoons UK! Follow NickALive! on Twitter, Tumblr, Google+, via RSS, on Instagram, and/or Facebook for all the latest Nickelodeon UK, NickToons UK and SpongeBob SquarePants News and Highlights! Mehr Nick: Nickelodeon To Premiere "Bruno & Boots: This Can't Be Happening At Macdonald Hall" In Germany, Switzerland And Austria On Monday 5th June 2017! Follow NickALive! on Twitter, Tumblr, Google+, via RSS, on Instagram, and/or Facebook for the latest Nickelodeon Germany and Teenage Mutant Ninja Turtles News and Highlights! Retrouve plein de vidéos de ToonMarty sur NICKELODEON.fr ! Plus Nickelodeon: Nickelodeon France To Premiere New Episodes Of "Game Shakers" From Monday 5th June 2017! Follow NickALive! on Twitter, Tumblr, Google+, via RSS, on Instagram, and/or Facebook for all the latest Nickelodeon France and ToonMarty News and Highlights! Sunday 4th June 2017 at 8:25pm - Teenage Mecha Ninja Turtles: A futuristic New York is barraged by mutant criminals and only a turtle team can take them down. Sunday 4th June 2017 at 8:55pm - Donatello and Raphael have a score to settle and will not rest until a true victor is crowned. More Nick: Nickelodeon USA To Premiere "Tales Of The Teenage Mutant Ninja Turtles" Hour-Long Special "When Worlds Collide" On 18/6! Additional source: Zap2it TV Listings; H/T: ToonZone Forums member kanc. Cox joined the number one kids brand in Australia at a good time, both personally and professionally. Nickelodeon's ticketed event Paw Patrol Live travelled to Sydney, Canberra, Brisbane, Perth and Melbourne in March and April 2017. More than 70,000 people attended. The show will head to New Zealand in September and October this year. 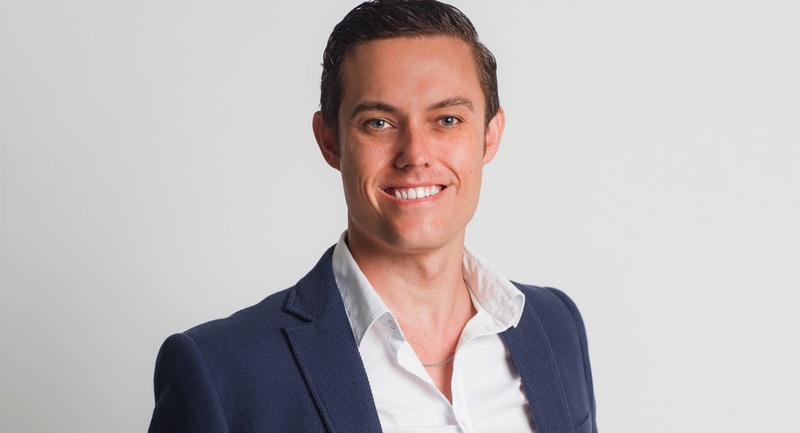 Cox took over from Jihee Nam as the GM of Nickelodeon Australia and New Zealand. Mediaweek spoke to Nam a number of times in the four years that she’d been in the job. She often spoke about her digital vision for the brand. Cox credited Nam’s digital background and expertise for leading the kids brand to the success it is currently experiencing in that arena. To celebrate Nickelodeon USA starting to premiere more brand new episodes of Bunsen Is a Beast Saturdays at 11:00am ET/PT from Saturday 3rd June 2017, Nick USA has unveiled a magical sneak peek preview from the first all-new episode, "Cookie Monster"; "Braces for Disaster" (#113), which you can watch in the monsteriffic video clip here on Nick.com! In the brand-new Bunsen Is a Beast episode "Cookie Monster", Amanda turns into a ferocious beast and causes panic at school after eating Bunsen's beast cookies! 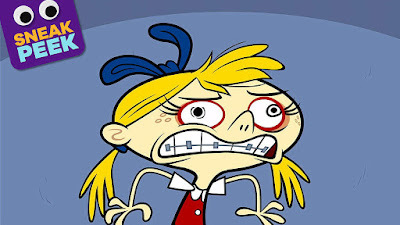 Then, in "Braces for Disaster", Mikey, Bunsen and Amanda team up to study Minks after Amanda's tightened braces cause her to make Mink calls. In Nick's super sneak-peek preview, "Amanda Is a Beast", Amanda wants one of Bunsen's cookies... little does she know, the cookies turn people into beasts! Maybe it is a good idea to let her eat them after all! More Nick: Nickelodeon USA's June 2017 Premiere Highlights! To celebrate Nickelodeon USA starting to premiere more brand new episodes of SpongeBob SquarePants Saturdays at 10:00am ET/PT from Saturday 3rd June 2017, Nick USA has unveiled a Sponge-Tastic sneak peek preview from the first all-new episode, "Unreal Estate"; "Code Yellow" (#206), which you can watch in the super online streaming video clip here on Nick.com! In the brand-new SpongeBob SquarePants episode "Unreal Estate", when SpongeBob thinks he has an allergy to his pineapple, Squidward offers to help find him a new home; Then, in "Code Yellow", Squidward gets a nose job at the local hospital and SpongeBob tags along as moral support! 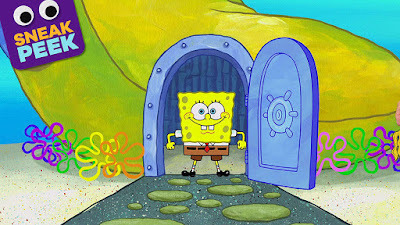 In Nick's fantastic sneak-peek, "House Hunting", Squidward is helping SpongeBob look for a new house! Do you think SpongeBob will move out of his pineapple? To celebrate Nickelodeon USA starting to premiere more brand new episodes of ALVINNN!!! 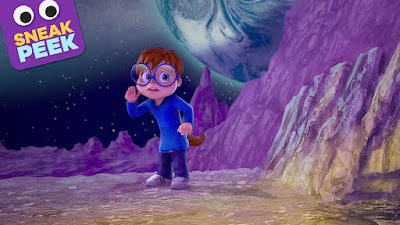 and the Chipmunks Saturdays at 10:30am ET/PT from Saturday 3rd June 2017, Nick USA has unveiled a super sneak peek preview from the first all-new episode, "Time Flies"; "Prank Calls" (#226), which you can watch in the fantastic online streaming video clip here on Nick.com! In the all-new ALVINNN!!! and the Chipmunks episode "Time Flies", Alvin and Brittany are convinced Simon has vanished back in time and go all out in an attempt to bring him back! Then, in "Prank Calls", Alvin's prank call gets out of hand when the person on the line vows to track him down *Gulp*! In Nick's fantastic sneak peek, "Time Traveling Simon", it looks like Simon has been playing with his time travel machine and now his brother can't find him! He could be any where in the past or the future! NEW YORK–May 31, 2017– Nickelodeon, the number-one kids entertainment brand, is introducing a brand-new collection of interactive, curriculum-driven preschool episodes in its NOGGIN video subscription service, beginning June 1 initially on iOS platforms. 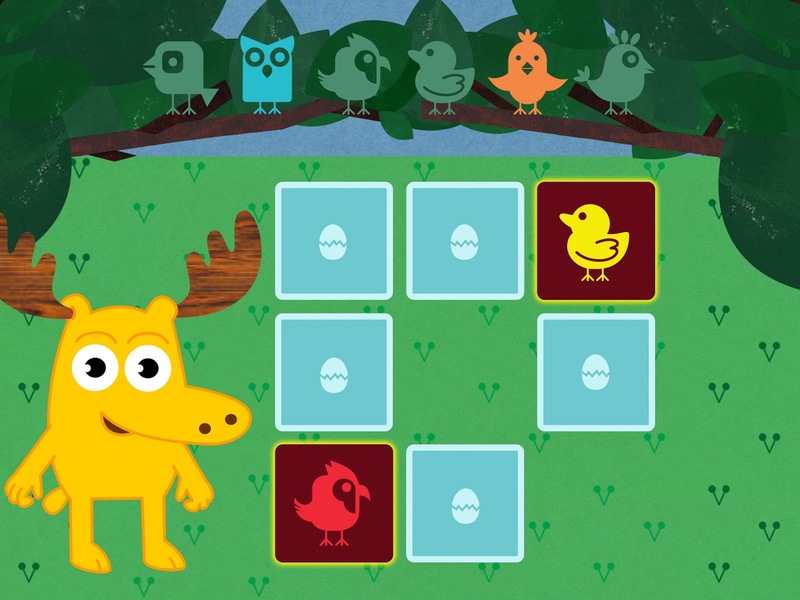 Nick’s play-along preschool videos were created by an in-house team using a proprietary authoring tool which enables the simultaneous creation of interactive digital content alongside the production of linear TV content. 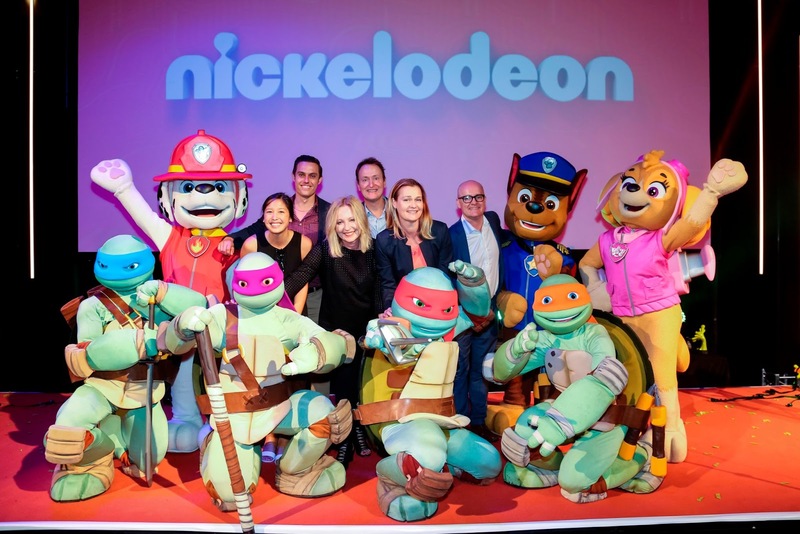 This inaugurates the use of a new production model that can grow across all Nickelodeon’s platforms moving forward. 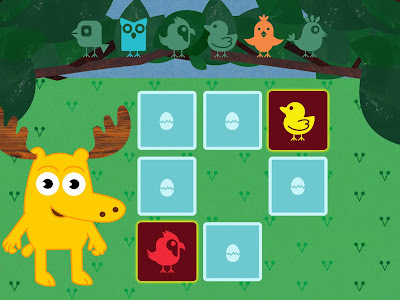 Nickelodeon’s play-along videos allow preschoolers to engage with their favorite characters by tapping, touching, swiping or speaking to navigate through enhanced educational experiences that promote science, technology, engineering, math and social-emotional skills–all while having fun every step of the way. At launch, more than 30 play-along videos will be introduced, including Blaze and the Monster Machines, Bubble Guppies, Team Umizoomi and short-form content featuring longtime beloved characters Moose and Zee. Nickelodeon’s new play-along video authoring tool puts the ability to create interactive digital content into the hands of Nick’s show creators, producers and animators. The tool supports real-time scene editing and a live preview that allows the teams to layer in interactive elements, to create brand-new play-along moments within any episode. Interactive writers and producers can also be integrated into a show’s creative team, allowing them to generate engaging, story-driven interactive videos from the start of a production and deliver both linear and play-along versions of the same episode simultaneously. Additionally, the play-along video player can be integrated into the existing Nickelodeon video apps, eliminating the need to download a separate app. Nick’s play-along videos were also created in partnership with curriculum and research consultants who helped shape the interactions to enhance the existing educational value of the shows. Throughout each interactive adventure, kids engage with content that fosters the development of cognitive, social and emotional skills. NOGGIN is an ad-free, video subscription service that features hundreds of iconic, full-length library episodes, short-form videos, educational content, music videos featuring preschoolers’ favorite Nickelodeon characters, and more, with new content added weekly. Consistently ranking at the top of the charts in the Family and Kids categories, the NOGGIN App is one of the top 10 grossing Kids apps on the App Store, in addition to being the number-one grossing app for Music and Video in the Family Category on Google Play. NOGGIN was also selected by Apple as an Apple TV app of the year. 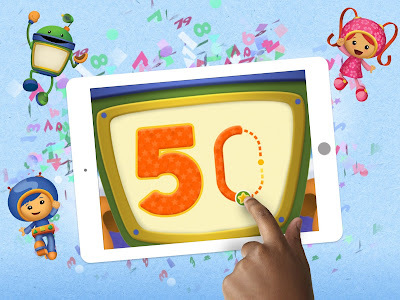 Currently available for iPad, iPhone, Apple TV, Android, Fire tablet and Roku devices, NOGGIN has 25 series to date including the recently added Yo Gabba Gabba!, Trucktown, Miffy and Friends and Teletubbies. Additional titles in the NOGGIN lineup include Blue’s Clues, Go, Diego, Go!, Franklin, The Backyardigans and Pocoyo, among others. 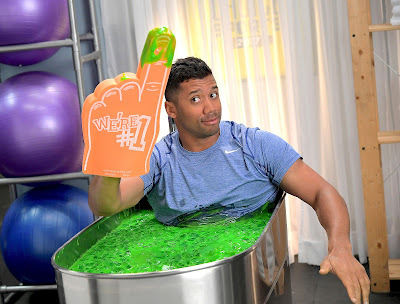 Pictured: Russell Wilson, host of KIDS' CHOICE SPORTS 2017 on Nickelodeon. Photo: Ben Watts / Nickelodeon. c 2015 Viacom International, Inc. All Rights Reserved. 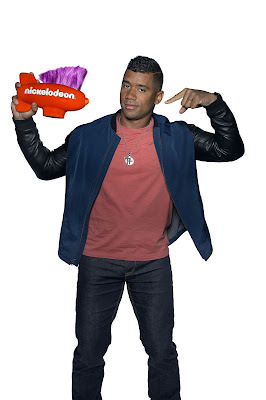 Burbank, Calif.,–May 31, 2017–The only kids’ show celebrating the world’s best athletes and epic sports moments, Kids’ Choice Sports 2017 welcomes back Seattle Seahawks’ franchise quarterback and Super Bowl champion, Russell Wilson as host. Airing Sunday, July 16, at 8:00 p.m. (ET/PT), Kids’ Choice Sports 2017 will be taped live on Thursday, July 13, from UCLA’s Pauley Pavilion in Los Angeles. “Super excited and honored to three-peat and host Nickelodeon’s Kids’ Choice Sports 2017. Kids get ready… three times the slime coming your way,” said Russell Wilson. Additional athletes competing for the coveted mohawked blimp include Alex Morgan, Cristiano Ronaldo, Dale Earnhardt Jr., Danica Patrick, Lizzie Armanto, Mike Trout, Stephen Curry, Tom Brady and Von Miller, with two nods each. 28 superstar athletes are set to receive first-time nods including: Le’Veon Bell, Laurie Hernandez, Dak Prescott, DeAndre Jordan, Alyson Felix, Sergio Garcia, DeMarcus Cousins and others. Nick.com/kids-choice-sports/ will serve as the official destination for Kids’ Choice Sports 2017. Beginning today, May 31, kids will be able to cast their votes for their favorite athletes and all-star moments from the past year. After voting, it’s game on, with all-star polls and sports-themed short-form videos for kids to check out online and on the Nick App. 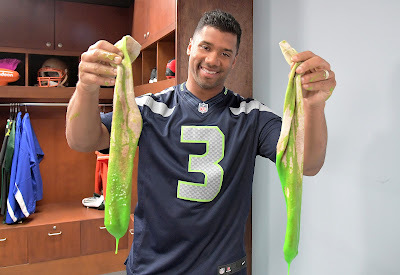 Click HERE for Russell Wilson’s bio. Nickelodeon’s Kids’ Choice Sports 2017 is produced by Done and Dusted in association with Nickelodeon Productions. Jay Schmalholz and Shelly Sumpter Gillyard are executive producers. Constance Schwartz and Michael Strahan of SMAC Entertainment will serve as executive producers, alongside Ian Stewart and Hamish Hamilton of Done and Dusted with Hamilton also serving as director of the show. Watch the brand-new Game Shakers special "Wing Suits & Rocket Boots" on nick.com/gameshakers and the Nick App! UK Fans: Catch the brand-new Game Shakers episode "The Bunger Games" on Friday 2nd June 2017 at 5:30pm, only on Nickelodeon UK & Ireland/HD! The ultimate funniest scenes from Zoey 101! Watch Zoey 101 on Nickelodeon, TeenNick and Nicknight! Mehr Nick: Victorious - “I want you back” Yerba-Edition | Nicknight | Nickelodeon Deutschland! SpongeBob hilft dabei, eine Saftkatastrophe aufzusaugen! More Nick: How Far Will Jace Norman Go to Help JoJo Siwa Get Ice Cream? | Nickelodeon's Sizzling Summer Camp Special! Follow NickALive! on Twitter, Tumblr, Google+, via RSS, on Instagram, and/or Facebook for the latest Nickelodeon's Sizzling Summer Camp Special News and Highlights! 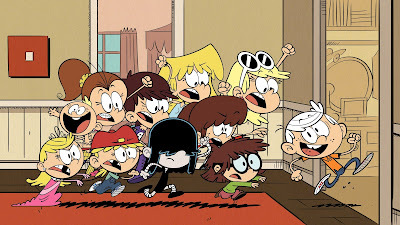 Scene from The Loud House episode "Intern for the Worse" (#202A). Catch all your favourite Nick superheroes all this May half-term during Half-Term Heroes, only on Nickelodeon UK & Ireland/HD! Follow NickALive! on Twitter, Tumblr, Google+, via RSS, on Instagram, and/or Facebook for all the latest Nickelodeon UK and Henry Danger News and Highlights! Nick start your summer at nick.com/summer! The Brooklyn Cyclones will turn MCU Park into Adventure Bay for a day on Sunday, June 25th when the Cyclones host NICK JR. DAY featuring Paw Patrol with appearances by Marshall and Skye! As part of the fun and excitement that afternoon, fans can purchase a limited edition Paw Patrol Ticket Package that will include a Field Box Ticket and Paw Patrol t-shirt (available in Toddler and Youth Sizes) for $20 per child. Additional adult tickets can be purchased for $17. To purchase tickets please call Nicole Kneessy at 718 - 382 - 2604 or for additional information, e-mail NKneessy@BrooklynCyclones.com. The t-shirt package is ONLY available through this offer and is not a general giveaway. T-shirts will be claimed at the ballpark, using a voucher you will receive with your tickets, the day of the event on field level off of the main lobby. For those who have already purchased tickets, but would like to add on the t-shirt package please contact Nicole as well. Please note that character times are subject to change and final appearance schedules will be posted on-line prior to the game and in park on the day of the event. Due to expected demand we can not guarnatee that time limitations will allow everyone will be able to get photos with the characters, but we will try our best to make sure everyone goes home happy. In addition, the Cyclones will be wearing special "I'm Fired Up!" jerseys inspired by everyone's favorite dalmation - Marshall. The jerseys will be raffled off following the game with proceeds to benefit local charities. It's also a Sunday Funday, so the first 1,500 kids 16 & under will receive a FREE Cyclones Autograph Panel baseball and will be invited on the field to get signatures from the Cyclones on the field prior to the game. The match will be Brooklyn Cyclones Vs. Hudson Valley Renegades. More Nick: Spin Master Working On First-Ever "PAW Patrol" One-Hour Special; Nickelodeon To Debut "Rusty Rivets" Season 2 In November 2017! 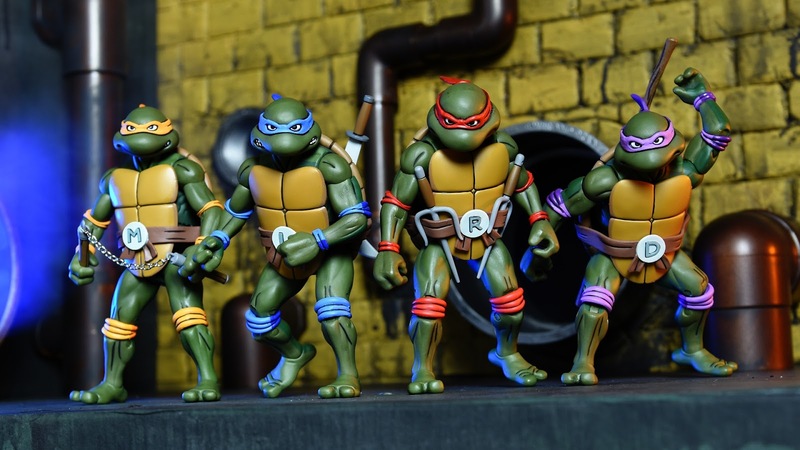 Collectables specialist NECA has unveiled a brand-new limited edition line of Teenage Mutant Ninja Turtles figures, which have been developed as an exclusive for Comic-Con International: San Diego 2017! This amazing set of eight cartoon-themed figures will retail for $200.00 and comes packed with cartoon relevant accessories. The set also comes packaged in a beautifully illustrated, SDCC themed carrying case! The best news is that the set will also be available for pre-order for non-attendees at https://thenecastore.com in June! Be sure to follow NECA online on Twitter and Facebook for more details in the coming weeks. Festival international du film d'animation d'Annecy has announced the very exciting news that Nickelodeon will treat attendees of the "A Conversation with Nickelodeon Creators Joe Murray and Robert Scull" session at the 2017 Annecy International Animated Film Festival and Market (MIFA) to an exclusive sneak peek at the networks upcoming brand-new Rocko's Modern Life TV movie! Taking place on Friday 16th June 2017 between 4:30-5:45 p.m. at Bonlieu Petite Salle, “A Conversation with Nickelodeon Creators Joe Murray and Robert Scull” will place the minds of Joe Murray (Rocko's Modern Life) and Robert Scull (Bubble Guppies, Butterbean's Café) in the same room to discuss bringing their visions to life and the trajectory of their prolific careers in animation from the 1990s to the present. The panel will be moderated by Chris Viscardi (The Adventures of Pete & Pete, Alvin and the Chipmunks, Snow Day, Inside-Out Boy, Angus, Thongs and Perfect Snogging, Sanjay and Craig), Senior Vice President (SVP), Content Development, Nickelodeon Franchise Properties. 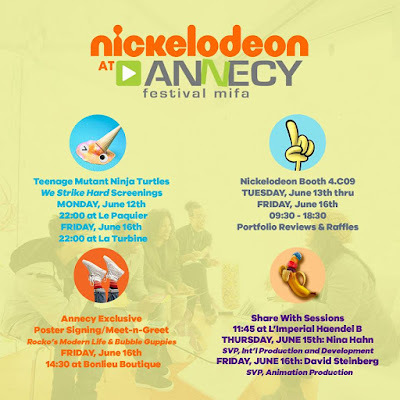 Leading up to the panel, Nickelodeon will host a Annecy Exclusive Rocko's Modern Life / Bubble Guppies Poster Signing and Meet-n-Greet session on Friday, June 16th at 2:30pm at Bonlieu Boutique Festival @ bd fugue! Additionally at Annecy 2017, Nickelodeon will host the premiere of the brand-new Teenage Mutant Ninja Turtles short "Strike Hard" at a special open air screening on Monday 12th June 2017 between 22:10 - 22:15 at Le Pâquier, and will host an additional screening on Friday 16th June 2017 from 10:00pm at La Turbine! The most famous turtles in the world are making a comeback in a brand new short from Nickelodeon. Catch up with the famous pizza-eating foursome, Leonardo, Raphael, Donatello and Michelangelo, in an exclusive short from Nickelodeon. Brought into this world in 1984 on the pages of Kevin Eastman and Peter Laird’s comic book, The Teenage Mutant Ninja Turtles were soon after adapted for television and cinema. A huge sensation around the world, they’ve been captivating entire generations for over 30 years. We follow the adventures of four turtles who live in the sewers of New York City with their adoptive father, a rat named Splinter. Transformed into anthropomorphic creatures after being exposed to a strange ooze, the turtles are masters of martial arts and defend the city as masked vigilantes. Acquired in 2009 by Nickelodeon, TMNT got a makeover with the release of a new series made entirely with CGI. Despite some risky changes to the writing, the series was rather well-received by audiences and the fifth season is currently in production. Riding on the wave of success, Nickelodeon has created several spin-offs and merchandise (toys, video games) including the short films that feature our heroes in brand new adventures, like Teenage Mutant Ninja Turtles Short "Strike Hard", where the Ninja Turtles and Krang take off on an epic high-speed chase through NYC. Come and watch it before the open-air screening of Leap! on the Pâquier. More information about Nickelodeon at Annecy International 2017 can be found here on NickALive!. Nickelodeon is joining the PercyVites party! Digital party platform PercyVites has partnered with Nickelodeon to launch new personalized invitation videos across the US and Canada! PercyVites' new customizable invitations and thank-you video templates allow users to upload photos, party details and messages alongside favorite Nickelodeon characters from Teenage Mutant Ninja Turtles, SpongeBob SquarePants, PAW Patrol, Dora the Explorer and Shimmer and Shine. “We’re really pleased to partner with Nickelodeon to offer new and exciting licensed video invitations and thank yous to PercyVites users,” said Julie Steiner, CEO of Percy3D. Tickety Toc and Little Charmers to its platform. Things are going to get LOUD this June when Nicktoons UK & Ireland premieres more brand-new episodes of Nickelodeon's hit animated series The Loud House daily at 5:00pm from Monday 5th - Thursday 8th June 2017! LOUD is the new quiet! Visit nicktoons.co.uk/loudhouse to watch exclusive The Loud House videos and play aweslime games! A beast and a human form an unlikely friendship in Nickelodeon's newest animated series Bunsen is a Beast, premiering Sunday 23rd July 2017 at 12:20 Uhr on Nickelodeon Austria (Österreich) and Nickelodeon Switzerland (Schweiz)! Created and executive produced by Butch Hartman (The Fairly OddParents/Cosmo & Wanda: Wenn Elfen Helfen), the 20-episode series follows the adventures of Bunsen, the first beast to attend a human grade school, and his best friend Mikey. Following the shows debut, new episodes will air regularly Sundays at 12:20 Uhr. 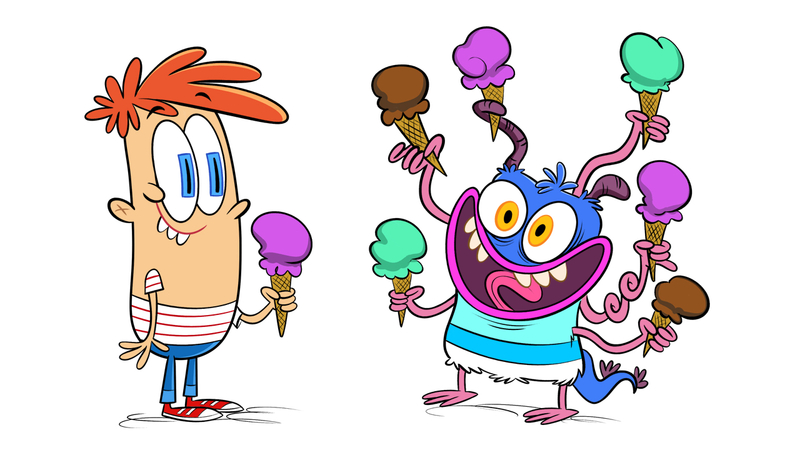 Bunsen and Mikey in Nickelodeon's Bunsen is a Beast. 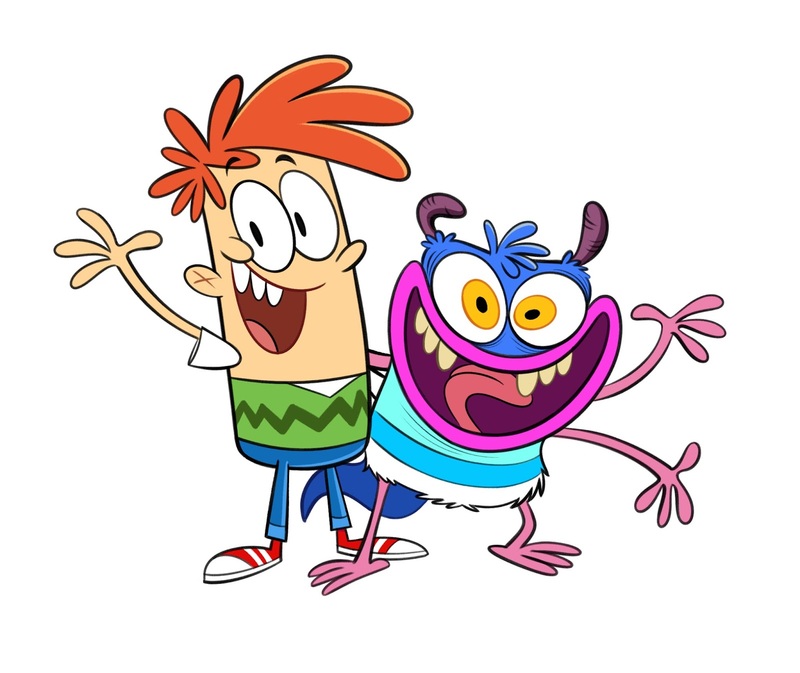 The voice cast of the US-English dub of Bunsen is a Beast includes: Jeremy Rowley (iCarly) as Bunsen, the first beast ever to attend a middle school for human kids; Ben Giroux (Henry Danger) as Mikey, a sweet and quirky kid and Bunsen’s best friend; Cristina Milizia (Monster High) as Darcy, Bunsen and Mikey's homeschooled friend; Kari Wahlgren (The Fairly OddParents) as Amanda Killman, the rigid and rule bound beast hater; comedy legend Cheri Oteri (Saturday Night Live) as Miss Flap, Mikey and Bunsen's eccentric teacher; Jeff Bennett (Jake and the Neverland Pirates) as Bunsen's Dad; and Jennifer Hale (The Powerpuff Girls) as Bunsen's Mom. Additionally, Wahlgren and Rowley also voice Mikey's Mom and Dad. Visit Facebook and Instagram to learn more about Bunsen is a Beast. Bunsen is a Beast is produced by Nickelodeon in Burbank, which officially opened the doors to its newly expanded building -- an over 200,000 square-foot, state-of-the-art, sustainable complex on January 11. Hartman began his animation career as an assistant animator on An American Tail. He created his own shorts for What a Cartoon!, and also wrote and directed episodes of Dexter's Laboratory, Cow & Chicken and Johnny Bravo. 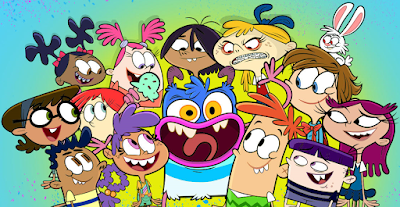 Bunsen is a Beast marks Hartman’s fourth animated series for Nickelodeon. Hartman joined Nickelodeon in 1998 where he created and produced several cartoon shorts for the Oh Yeah! Cartoons series, including The Fairly OddParents. Commemorating the 10th anniversary of the animated series, Hartman brought the series to life in the 2010 live-action/CG animated hit TV movie, A Fairly OddMovie: Grow Up, Timmy Turner! The series came to life once again in the original TV movie, A Fairly Odd Christmas in 2012 and A Fairly OddSummer in 2014. Hartman is also the creator of Nickelodeon's animated series Danny Phantom and T.U.F.F. Puppy. More Nick: Nickelodeon To Premiere "Bruno & Boots: This Can't Be Happening At Macdonald Hall" In Germany, Switzerland And Austria On Monday 5th June 2017! Follow NickALive! on Twitter, Tumblr, Google+, via RSS, on Instagram, and/or Facebook for the latest Nickelodeon Austria, Nickelodeon Switzerland and Bunsen is a Beast News and Highlights!